Despite being a close economic grouping, taxation regimes vary across the 10 member states of the Association of Southeast Asian Nations (ASEAN). While there have been moves by ASEAN members to bring their taxation regimes in line with regional integration goals, latent FDI competitiveness has led to the adoption of national strategies that are marked by adjustments in tax rates and formulation of various tax incentive schemes for foreign investors. 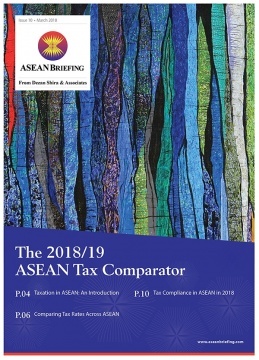 For overseas investors looking to enter emerging markets in ASEAN, a clear understanding of the various taxes they could potentially be exposed to, remains a key element for early success in one of the world’s most dynamic economic regions. As ASEAN progresses towards full economic integration, a clear understanding of the intricacies of taxation in the region is key for potential overseas investors. With its proven business intelligence, tax, and market entry knowledge within ASEAN, Dezan Shira & Associates is well positioned to assist companies who are exploring their options in ASEAN, and looking to take advantage of Asia’s most dynamic economic region.